Order one for each VT office and location to be fully compliant. The 2019 All-In-One Labor Law Poster will include the following state & federal requiredposters for all businesses into one laminated 25" x 39" poster. 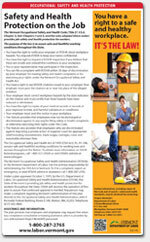 The VOSHA poster is included on the Vermont Complete Labor Law Poster. When you order the Vermont Complete Labor Law Poster, it will satisfy your State, Federal, and OSHA posting requirements with one poster. 09/2018 - Minimum Wage Poster - Revised to include new 2019 minimum wage rates and contact information. 09/2018 - Sexual Harassment - Revised to include new 2019 minimum wage rates and contact information. 06/2018 - Employment Protections for Victims of Crime - New Employment Protections for Victims of Crime notice which allows employees who are victims of crime to take time off. 01/2018 - Pregnancy Accommodations - New posting requirement for the state of Vermont. 12/2016 - Earned Sick Time - Newly required poster for the state of Vermont. 12/2014 - Minimum Wage Poster - Updated to reflect new 2015 minimum wage rate of $9.15 per hour, effective 1/1/2015. 10/2014 - Occupational Safety and Health Protection - New poster requirement: "Posting of Safety Records Notice" to inform employees of location of workplace safety records. 02/2019 - Minimum Wage Poster - Minor revision to update the phone/fax contact numbers as well as the revision date on the notice. 12/2017 - Whistleblower Protection Act - Updated with a new design and new contact information. 10/2015 - Unemployment Insurance - Update to Unemployment insurance poster, revisions include changes to phone numbers and adddress listings for various office locations. 05/2015 - Workers' Compensation - Update to Workers Comp Reinstatement poster, revisions include new guidelines for rehiring practices, new contact info & format changes. 05/2015 - Employer's Reinstatement Liability - Update to Workers Comp Reinstatement poster, revisions include new guidelines for rehiring practices, new contact info & format changes. 01/2013 - FMLA Poster - Amendment expands the military family leave provisions and incorporates a special eligibility provision for airline flight crew employees, as well as making some additional regulatory changes. Many industries such as the restaurant, retail, construction, and professional use the Vermont Complete Labor Law Poster to satisfy their compliance requirements for State, Federal, and OSHA. When posted in an area frequented by employees, the Vermont Complete Labor Law Poster puts a business in full compliance. Federal contractors and subcontractors are required to display more postings in addition to the general State, Federal, and OSHA regulations. Please click here to see the federal contractor and subcontractor posting requirements. Ensure your full compliance by posting the Vermont Complete Labor Law Posters with the federal contractor-required postings.